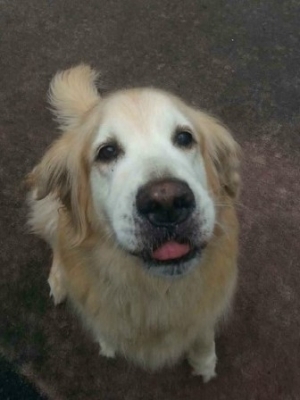 This is King, a loving 10-year old Golden Retriever who is recovering from a horrible experience. King’s human Mother tragically passed away at home, and no one discovered her or King for two weeks. King survived on the toilet water and food he was able to raid from kitchen cabinets, but he was traumatized and protective of his Mom. When people arrived at the home, King would not let anyone near her. An experienced dog trainer was called in to remove King from the home, which upset King even more. Fortunately, King was taken in by a wonderful trainer named Eddie Simon in the Danbury, CT area who has helped several Sunshine dogs with behavior modification. Eddie has helped King to relax and regain his confidence, and now King is ready for his forever home. King is a sweet and loving Golden boy, good with other dogs he meets although he probably did not know many other dogs in his former life. Another easy-going dog might be nice company for King in his forever home, but mostly, he just needs understanding humans. We do not know how he feels about cats, so a cat-free home, and no young children is best. King is energetic for his age and loves attention. Here is a video of a very happy King running alongside on a leash as Eddie rides his bike. click --> Run, King, Run! Eddie tells us that "King is well trained with "sit," "stay," and "lay down." In fact, if he begins to act up, you just have to tell him to "sit" and he stops with better results than if you use the word "no."